Little Stint x 2 in Churnet Bay this morning also Yellow-legged Gull..........Birdguides. Red-necked Grebe still on main lake and adult Little Gull......Birdguides. Greenshank , 3 x Common Sand and 10 x Lapwing.......K Tate. Common Sandpiper still present early morning.......J Hutchins . Common Sandpiper still early morning.......SS. Barn Owl one present this evening........D Powell. Barn Owl hunting by sewage works at 22-30.......GB. Common Sandpiper still early morning........J Hutchins. Whinchat , 2 x Redsatrt , 6 x Wheatear and Grasshopper Warbler.....Rob. Redshank , Greenshank and Little Egret.............JA , BD. Adult Red-necked Grebe still on main sailing lake , also adult Little Gull .....SR.
Little Stint one in Blithe Bay early evening and Garganey in Tad Bay.......Birdguides. gravel pits through the wood.........Birdguides. Red-necked Grebe adult still on main sailing lake also adult Little Gull.....Birdguides. Knot one this morning , also 2 x Ruff.........Birdguides. 2 x Shelduck and female Mandarin.............NP. Osprey still early afternoon and Little Egret ......... Birdguides. 1 Whinchat, 4x Redstart and 12x Wheatear....RT. 3 x Black Tern off the causeway and 2 x Sanderling at Admaston Reach.....Birdguides. Pectoral Sandpiper on Flash through wood, also Black-necked Grebe on south pit plus 13x Green Sandpipers , 13 x Curlew , Dunlin , Greenshank , 2 x Little Egret , Snipe and Hobby.......J Woodcock. Spotted Flycatcher x 10 , Tree Pipit and Garden Warbler........R Powell. Hobby , 15 x Teal , 3 x Shoveler , Shelduck , Gadwall and 8 x Egyptian Geese.......R Powell. and a least 2 x Whinchat.........BB. I would like to welcome Russell Toon to the Staffs Bird News team along with myself and Chris Waring we hope to bring you a more reliable service with Russell on board. Black-tailed Godwit one present early morning........CW. 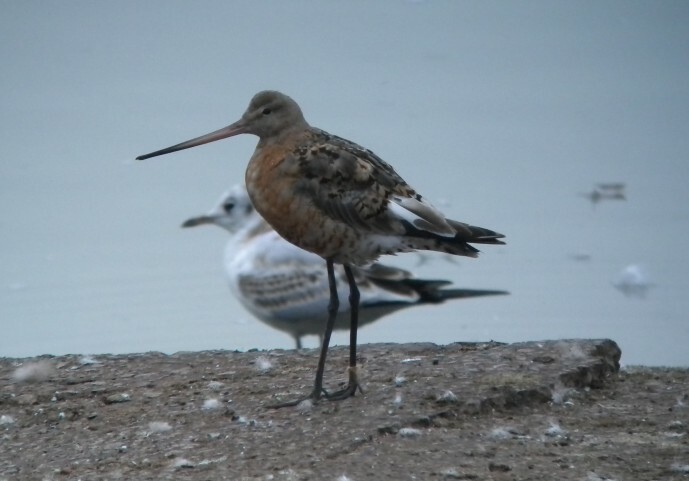 Black-tailed Godwit at Westport photo from Nick Smith. Red-necked Grebe still present on boating lake.........S Richards. Greenshank , 5 x LR Plover , Common Sand and 3 x Whinchat still below the dam......BB. Turnstone x 3 on main pit this evening also 2 x Greenshank.........Birdguides. Whinchat x 3 present this morning..........Birdguides. Red-necked Grebe still on main sailing lake........Birdguides. 6 x Ringed Plover and 2 x Kingfisher.............J Woodcock. Yellow Wagtail x 2 , Little Owl and Greenshank.........J Woodcock. Tree Pipit (trapped and ringed)......Birdguides. Tad Bay......Ringed Plovers , Greenshank and Hobby. Causeway.......Hobby , Yellow Wagtails and Wheatear. Sailing Club......Yellow Wagtails x 12 , Ruff and Common Sand..........A Stanton. Little Gull x 2 juveniles in Blithe Bay , also 3 x Greenshank and Wheatear....Birdguides. adult Y L Gull and 2 x Garganey..........R Broadbent. Causeway....Dunlin , 2 x Ringed Plover and Common Sand........R Berry. Red-necked Grebe still on main sailing lake.....Birdguides. Greenshank , Peregrine x 2 and 2 x Raven...........R Powell. Arctic Tern juvenile on The Void at mid-day (site first).......NP. Ruff x 5 , Curlew x 9 , Green Sand x 3 , Common Sand and Oystercatcher.....JW. Common Tern x 2 (adult & juv) this afternoon........J Jones. Whinchat one along the rough track......Birdguides. Little Egret one present this morning.......Birdguides. Deep End.....Yellow Wagtail x 10+ . Causeway.....LR Plover x 2 . Blithe Bay.....Greenshank x 3 and Curlew . Common Sand x 2 and Osprey..........R Berry. Arctic Tern juvenile this am , also juvenile Ruff and 2 x Whinchat ........Birdguides. Red Crested Pochard x 4 still present on JCB lakes today......Birdguides. Wood Sand still , also 2 x Greenshank and Little Egret........TVB. Whinchat , 2 x Spotted Flycatchers and Lesser Whitethroat.......RT. 13 x Black-tailed Godwits , Garganey and Greenshank........Birdguides. Juvenile Spotted Redshank this afternoon, also 2x Ruff, 16x Green Sandpiper, 2x Common Sandpiper, 3x Water Rail & Little Egret.........................NS, CW. 2x Garganey, Black-necked Grebe, 2x Dunlin, Osprey & Peregrine in Tad Bay..........................NS, CW. Tree Pipit over The Void this morning.......PJ. Red Crested Pochard x 4 on JCB lakes today......Birdguides. Red-necked Grebe....Gailey Res....photo by S Seal. 2 x Lesser Whitethroat below the dam.......BB. Osprey , Peregrine , 4 x Greenshank , Ruff and Black-necked Grebe, Oystercatcher. LR Plover x 3 , Ringed Plover and Common Sand . Yellow Wagtail x 6 and Wheatear x 2...........R Berry , M Whalley. Red-necked Grebe still present on main lake 7-30 , also 7 x Yellow Wagtails. S Richards. Little Gull adult this evening , also Hobby and Kingfisher.........JJH , SJH. 6x Teal, 1x Pochard & 1x Shoveler on main lake, also 12x Swifts............CW, NS. Yellow-legged Gull near adult present today.....NP. 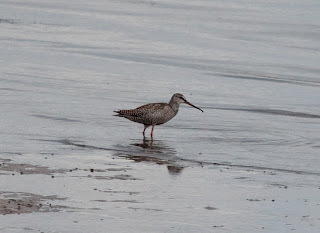 Spotted Redshank......Blithfield Res.....photo by S Seal. Red-necked Grebe on mail sailing lake...........SS. Spotted Redshank showing well at Admaston Reach with 2x Common Sandpipers also 10+ Yellow Wagtails in St.Stephen Bay.........SS. Black-necked Grebe and Osprey (12-00)...........Birdguides. One Wheatear, Lesser Whitethroat and Little Owl.................RT. Little Gull adult again early afternoon , also 6 x Common Sand on the dam.......BB. Hobby x 2 over @ 13-25........G Hadley. Red-necked Grebe......Gailey Res........photo by S Seal. Red-necked Grebe....Gailey Res......photo by D Fowler. 2x Yellow Wagtails flew around main lake briefly..........CW. Red-necked Grebe (adult) still present on boating lake at 18.00..........Birdguides. Little Gull adult on main lake this evening.........Birdguides. Greenshank x 5 this morning , also 4 x Green Sand , 4 x Common Sand , Ringed Plover . LR Plover , and 2 x Whinchat below the dam........BB. Causeway.......2 x Common Sand . St Stephens Bay.......2x Spotted Redshank and 10+ Yellow Wagtails . Dunlin , 3 x LR Plover , Black-necked Grebe and 2 x Wheatear..........R Berry. Wood Sandpiper x 2 , also 9 x Green Sand , Ruff , Hobby and 10 x Curlew......J Woodcock. Peregrine on the Incinerator this morning present for the last couple of days......A Stanton. Spotted Flycatcher x 3 this morning , also 2 x Wheatear and 2 x Lesser Whitethroat......RT. Tree Pipit x 2 this morning , also 2 x Raven........J Hutchins. 13 x Curlew and 3 x Water Rail..........J Woodcock. Hobby over the Dragonfly Pool this morning.............................CG. Spotted Redshank...Blithfield photo by Martyn Yapp. Spotted Redshank juvenile in St Stephens Bay this morning and Redshank . Turnstone one in Ten Acre Bay . and Yellow Wagtail Blithe Bay . Wheatear x 2 and Common Sand on Causeway . Garganey 2 , Little Egret x 2 Osprey and 8 x Ringed Plover Tad Bay......MY , KD , RP. Black-necked Grebe still present this morning.....MY , KD. 12 x Green Sand , 12 x Curlew and 5 x Little Egret ......J Woodcock. Green Woodpecker x 3...........J Stanley. Ruff x 2 , Greenshank x 7 , Common Sand x 3 and Yellow Wagtails x 10....T Perrins. Little Gull adult breifly this morning before flying off west.....Birdguides. Osprey present this afternoon........MY , KD. Common Buzzard x 2 over.....R Bullock. Red Kite over farmland at 17-45 between Tixall and Milford.........G Hadley . Wood Sand one this evening , also Greenshank.......Birdguides. Redstart male still present this morning.......GB. Spotted Redshank juvenile at deep end in St. Stephen's Bay briefly before being flushed; also 2 Garganey in Blithe Bay, 2 Black-tailed Godwits and 3 Ruff in Tad Bay......Birdguides. Greenshank x 2 , Green Sand x 2 and 5 x Curlew this morning......EJF. Arctic Tern x 2 over Cauldon Canal this morning......RGM. Ringed Plover (juv) & Common Tern this morning..............NP. 4x Gadwall & Little Grebe this am...............NS, CW. Black-necked Grebe juvenile still on main lake this evening......Birdguides. Whinchat x 2 still below the dam............BB. 3x Greenshank & 2 Whinchat...........Birdguides. Garganey x 2 , also 14 x Black-tailed Godwit , 3 x Hobby and Peregrine . Black-tailed Godwit.............JJ & SJ Holihan. Little Gull adult on main lake late evening , also juvenile B N Grebe.....Birdguides. Crossbill x 16 present this morning.......NP. Common Tern through early morning , also Peregrine......J Hutchins. Redstart male at the Sewage Works this morning.......GB. 5x Gadwall on main lake this morning...........................NS, CW. Wheatear x 2 this morning........RT. Common Sand , 2 x LR Plover , 12 x Common Tern , and 3 xShoveler.......R Powell. Sanderling one on the dam this morning , also 2 x Whinchat........Birdguides. Common Tern x 4 (3 x adults , 1 x Juv) @ 6-35 before flying off west...G Brereton. Osprey & Little Egret still present in Tad Bay.........................CW, NS, GAS. 3x Greenshank, 2x Green Sandpiper & 3x Dunlin.......................CW, NS. Roesel's bush Cricket x 5+..................JW. Roesel's bush Cricket ......photo by J Woodcock. Common Tern x 2 over @ 7-35.........J Hutchins. Turnstone one this morning , also 2 x Greenshank......Birdguides. Common Tern x 6 @ 10-00 ...........JJ. Green Sand and 6 x Common Sand on the dam........BB. Hobby x 2 , also 3 x Spotted Flycatchers and Little Egret.......SR.
Med Gull 1st summer/2nd winter still present this pm........Birdguides. Crossbill x 2 over @ 6-15 this morning , also Snipe present........J Hutchins. Redstart x 2 this morning also Wheatear.......R Toon. Oystercatcher over at 6-35 , also Common Sand.......J Hutchins. Spoonbill still in Tad Bay.........Birdguides. Juv Med Gull at West End........................Birdguides . Cuckoo juvenile this morning , also 2 x Wheatear.........R Toon. Greenshank x 5 also 2 x Hobby.........TVB.